Welcome to CanDo Kiddo! If you like what you see, subscribe here for free updates, or you can "like" the CanDo Kiddo Facebook Page here to join the conversation! Crawling is an important motor milestone of the first year that opens up a whole new dimension of play and exploration for your baby (and new dimensions of parenting - Hide your breakables! Install the babygates!). Sure, some babies skip crawling but it's important to make sure they don't skip it because they're missing important foundational strengths or skills. 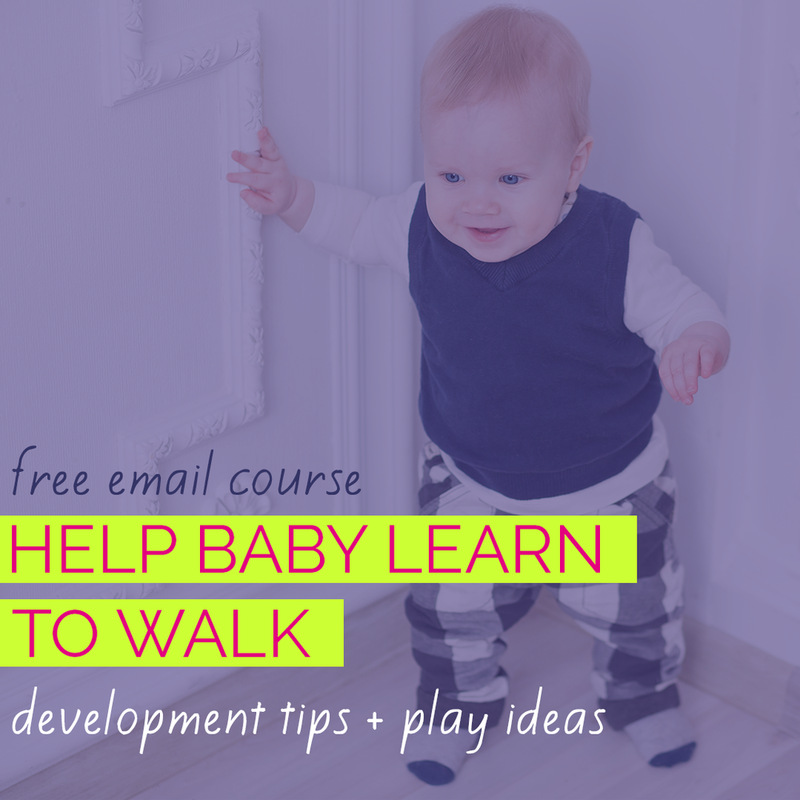 Learn why some babies skip crawling. Because I'm a pediatric Occupational Therapist, my answer to nearly every question that begins with, "How can I teach my child to...." is PLAY. 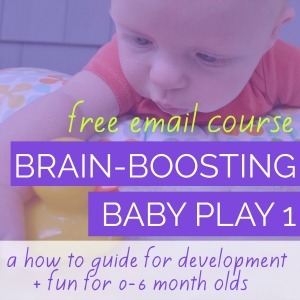 Let's look at how play can help set the stage for your baby starting to crawl. You knew it was coming! Reason 4,302 that Tummy Time is awesome and vital for your baby's development. Belly-down play strengthens the upper body and core muscles (belly and back muscles). Tummy Time also helps your baby strengthen neck muscles and work out of normal asymmetries from their womb position or mild Torticollis. Curious about asymmetry and Torticollis in newborns? Learn more about it in this post. Through floortime play unrestricted by Baby Holding Devices, babies begin to learn about their bodies through their touch (tactile), pressure & stretch (proprioceptive), movement (vestibular) and visual senses. Offer your newborn a variety of different surfaces to play on in order to experience her body in new ways and gain valuable body awareness. Once your little one is a few months old and able to consistently hold her head up in Tummy Time, try letting her play on hardwood or linoleum floors. Place her blanket on thick, soft grass. Let her wiggle and move on your mattress (with close supervision - eyes on baby within arm's reach). You may notice that she has different skills or movements on different surfaces. In seated play, your little one has the opportunity to twist and turn her torso to explore and touch toys. This rotational movement is an important precursor to crawling. Placing toys to either side can encourage twisting. Discover 5 Ways to Support a Wobbly Sitter. In my book, "Begin With A Blanket: Creative Play Ideas For Baby's First 4 Months", I describe play activities and positions for the first weeks of life that help newborns strengthen and balance core muscles (belly and back) long before they are ready to work on sitting. Available here. To promote coordination of the two sides of the body, offer your baby toys that encourage two-handed play - such as larger toys and rattles or round toys that are tricky to hold with one hand. One of my favorites is a simple playground ball from the drugstore. Not only does it encourage two hand play, it's likely to roll away and be a great motivator to move! Motor planning - or problem-solving new movements - is a vitally important life-long skill and one that pediatric therapists are seeing increasing deficits in. 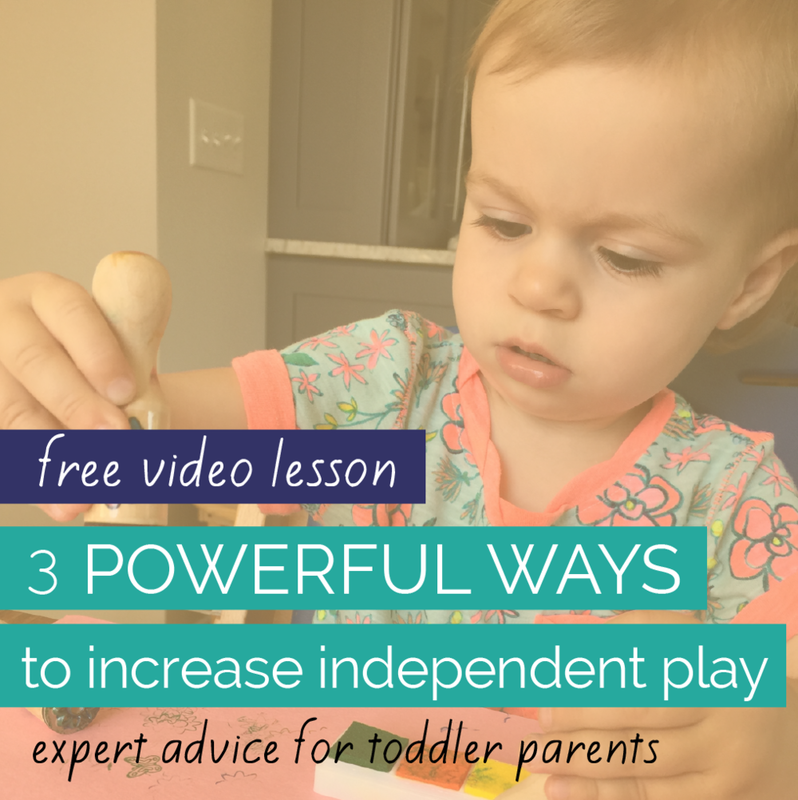 Provide your baby with lots of opportunities to move toward toys just out of reach and allow your little one to be a little frustrated at times. You'll likely notice around 5-7 months that you baby gets more fussy or whiney in floortime play. It's a phenomenon that drives many parents crazy but ultimately I think it marks the time when they have a strong drive to move and know that it's possible, but don't quite have the skills yet. Be patient, give your little one gentle, encouraging words and resist the urge to jump in and help at the first whine or whimper. A physical therapists' favorite baby products that promote crawling. Explore a Montessori baby room with low shelves to encourage independent movement. Make a crawling tunnel from a cardboard box. See what we're pinning! Awesome play activities, parenting tips and more... Like us on Facebook to join the conversation.